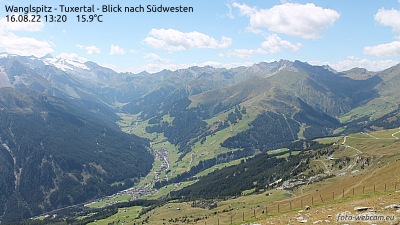 The Tux air, the water of the thermal springs, and the Hintertux glacier are unique and full of alpine freshness. Hiking, running, nordic walking, mountain biking, "Kneipp"ing, swimming in thermal water, summer skiing and boarding take care of the mountains for you. Canyoning, brainwashing, Flying Fox, tandem paragliding as well as glacier tours across millennia-old ice provide refreshing action. Locations for all that are the fascinating waterfalls, the Tux stream, the romantic mountain lakes, the ice rifts on the Hintertux glacer, and much more. Wether its adventure and action you're looking for, or quiet and relaxation - the ideal altitude of 850 to 3,250m provides the ideal conditions for sport and nature lovers! The scent of fresh herbs and flower meadows accompanies you on the way to your personal summit victory. The reward awaits you at the summit - a breath-taking view of hundreds of mountain peaks! More than 350 km of hiking trails await you in Tux-Finkenberg, each with its own character: easy walking trails, high paths to romantic mountain lodges, and steep alpine trails lead past glass clear mountain lakes, over fragrant flowery meadows and through age-old mountain forests. Every Monday, Wednesday and Friday (July - September) an experienced glacier guide from the Tuxertal ski school will take you on an exciting trip on the Hintertuxer Glacier. At the spectacular altitude of 3,250 m you will get to know the surrounding mountain world and be able to enjoy the breathtaking views. Walk on millennia-old glacial ice, past powerful, turquoise ice cracks, and discover interesting facts about the birth and creation of our glacier. You'll comfortably return after one hour by chair lift. Don't forget your mountain shoes and clothes! Nordic Walking in the idyllic Tux mountains! Athletic whole-body training on the one hand and the experience of Tyrolean landscapes on the other is made possible by "walking with sticks". In order to have fun from the start, we recommend an introductory course with a nordic walking trainer. The nordic sports active center is located in Tux, the alpine valley at the foot of the Hintertux glacier. This ideal altitude offers the perfect preconditions for sport and nature lovers! The idyllic mountain and glacier landscape (1,300 - 3,250 m) with healthy mountain air offers in summer 80 km nordic walking trails and 350 km of marked hiking trails.